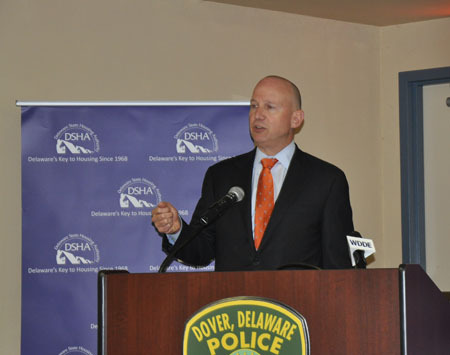 February 12, 2015 – (Dover, DE) – Governor Jack Markell today joined Delaware State Housing Authority (DSHA) Director Anas Ben Addi and Attorney General Matt Denn, along with other elected officials, to announce the recipients of $2.755M from the Strong Neighborhoods Housing Fund. Governor Markell has laid out a bold vision for Delaware by implementing a comprehensive approach to strengthening communities and rebuilding neighborhoods. In conjunction with Downtown Development District designations, which gives access to financial assistance for real property improvements, the newly created Strong Neighborhoods Housing Fund (SNHF) is another incentive to invest in our future. 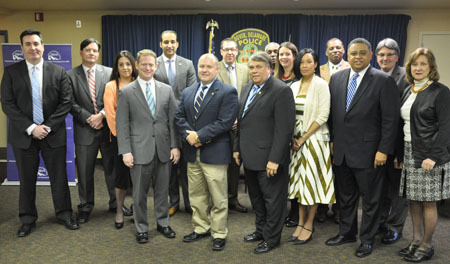 Last year, Delaware received funds from the JPMorgan Chase Mortgage Settlement. The General Assembly allocated $2.755M to DSHA as part of its FY 2015 appropriation to establish the SNHF. This revolving fund will support community development, address crime strategies, and transform neighborhoods that are experiencing blight or other forms of stress. The funding was made available to organizations through a competitive application process in targeted Delaware areas. Applications were received from nonprofit organizations, local jurisdictions, and for-profit developers partnering with nonprofit organizations. These funds will be used for the acquisition, renovation, and sale of vacant, abandoned, and foreclosed properties throughout the State. “This is an exciting time for the City of Dover, and I am thankful that we get to have an impact in a concentrated area by providing homeownership opportunities through Central Delaware Habitat, NCALL, and Milford Housing Development Corporation. Through our collaboration and commitment of others in the community, we will all work hard to create change in the downtown area,” commented Jocelyn Tice, Executive Director of Central Delaware Habitat for Humanity. “It’s a good use of the settlement funds which will allow a lot of nonprofits to move forward with developments in at-risk areas. There’s a big gap in funding that’s missing. I applaud the Governor and DSHA for creating this pot of money. A lot of developers couldn’t afford to create housing in these areas without the funds,” said Steven Martin, Executive Director of Wilmington Housing Partnership. To learn more about the Strong Neighborhoods Housing Fund, please visit http://www.destatehousing.com/Developers/dv_snhf.php or call DSHA’s Public Information Office at (888) 363-8808. View more photos of the event at: https://www.flickr.com/photos/destatehousing/sets/72157650372377750/.